Frostbite was born in a place where summer is a myth and a crowd consists of two people standing on the same acre. He worked briefly as lineman on the Trans-Alaska Pipeline System (TAPS) but found the job unchallenging despite the 40 degrees below zero temperatures and hazardous conditions. After years of living unpatriotically close to Soviet Siberia, he took the Army up on its promise to give him a challenge whenever he wanted one. He graduated from Transportation School, Fort Eustis, and Armor School, Fort Knox before being selected to join the arctic division of the GI Joe team. Frostbite is always ready to shut down Cobra operations in any arctic region. He is an expert in all forms of transportation, and can navigate his way through a blizzard with a steely eye and a big grin. If his vehicle needs field service, he's got to step out into weather that'll freeze a wrench to bare skin in five seconds, and carry through a repair job that would be taxing under ideal conditions, on top of fending off enemy forces. 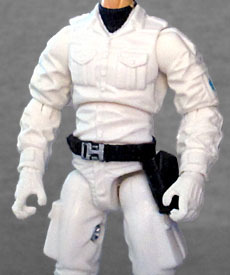 Frostbite was only the Joes' second Arctic trooper, after Snow Job. Despite being a 1985 character, he didn't appear very often in the cartoon - he was the driver of the Snow Cat, and while those appeared often, they were just driven by whoever. The figure is made from mostly reused parts. He gets the same torso as Alpine, the "work suit" arms from the Data-Viper, and Dusty legs. Hey, if they can keep out sand, they can keep out snow. His belt, with a holster on the left hip and a canteen on the back, has been seen on Short-Fuze (among others). To complete his classic look, he has a new fur shawl with a holster on his chest. The head is also new, created by Boss Fight Studios. He's wearing a furry hat and a pair of solid black goggles that can be worn on his forehead (like the vintage toy) or down over his eyes (when he needs to go into the snow to fix something. Frostbite was released three times in Generation 1, and every time his beard was a different color: black, then red, then brown. Other than the black goggles and belts, and the ecru fur, Frostbite is entirely white. Yes, the original toy was, as well, but so was the original Snow Job, and his G3 update got all sorts of fancy paint. Frostbite is white. He does have a blue... polar bear(?) on his sleeve, which the original also had, but for some reason it's been moved from his right arm to his left. How very odd! He's armed with a white sniper rifle, a black wrench, two white pistols with silver handles, and a white satchel that seems to be the same mold Snake-Eyes came with. In 1982. All the original Frostbite had was the rifle, since he also came with a giant vehicle. It's pretty exciting to get Frostbite at last. Not only does he have one of GI Joe's sporadic pun names - Farley S. Seward - he also the last 1985 figure who needed to be updated. It's kind of a shame that it had to be done via the subscriber-exclusive 13th figure in the FSS, but we're also relieved that this isn't another wet squib like last year's Grand Slam.